We’re going to flat out say it: if you’re serious about exercising, then gather all your strength and invest time and money in a home gym! We’ve got some home gym ideas that will help you build the home gym of your dreams, the place where you can sweat all the stress out! Before we begin with our home gym ideas, it is important to know you should ask yourself what kind of training you want, so that you can know what you want in a home gym, and start making a home gym plan and purchasing equipment. A gym is not a gym without a full body mirror. You need to see yourself from head to toe when you’re exercising. You ’re not just supposed to admire your new abs in the mirror! 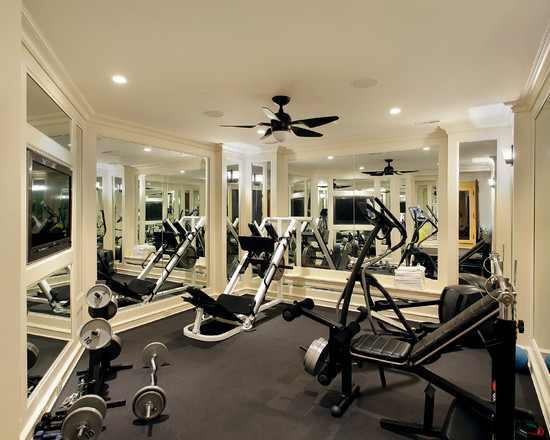 The home gym in the above picture has a spectacular wall-to-wall mirror that not only allows you to catch your every little movement, but also gives the impression that there is so much more space. 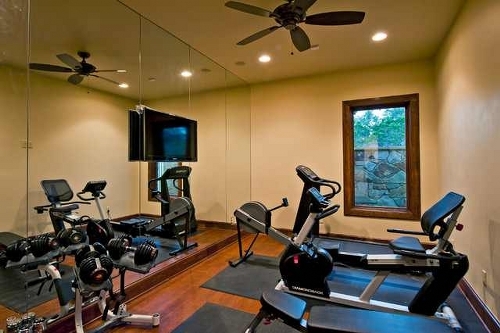 So, if you are looking for home gym ideas that add a little space, a wall-to-wall mirror is the perfect addition… and it’s quite cheap! If you’re looking for home gym design ideas for your first home gym, then our advice to you is to keep it simple. Look at the beautiful home gym above, with only a handful of machines and weights. Start small and gradually increase your accessories and equipment. Do so if and when you feel the need. If you start big, then there is a chance that you get overwhelmed by all the equipment. That’s never a good start when working out. Whether you want to lose weight, bulk up or stay in shape, getting the heart working is something that simply needs to be done. Try developing a cardio circuit in your home gym. Some great home gym equipment ideas include skipping rope (which is an absolutely wonderful cardio workout), to aerobic steppers to the treadmill; basically whatever you like that keeps your heart rate up. It doesn’t even have to be high tech or expensive. An old-fashioned jumping rope will do the trick, and if your ceiling is too low to accommodate the skipping rope there are ropeless skipping ropes. They’re really weighted handles that feel like the real thing. 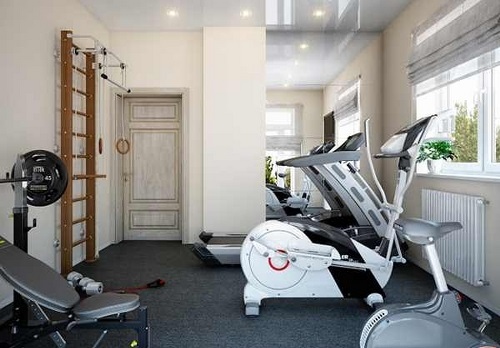 If you don’t have enough room for home gym, then why don’t you incorporate your gym in a room? 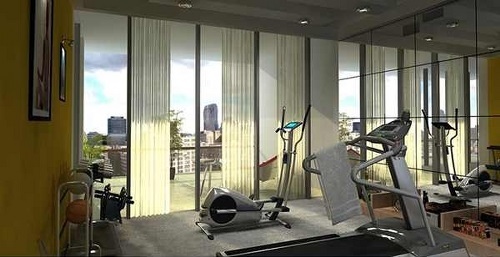 A living room/gym is something that you could live with, isn’t it? 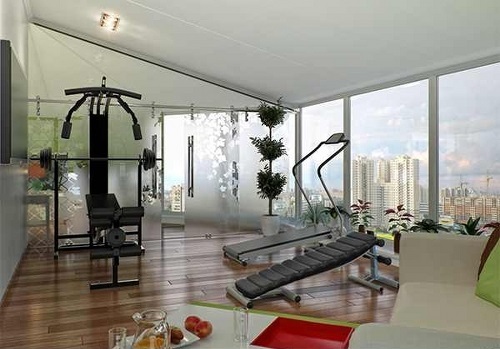 Look at the awesome living room/gym in the picture above! Isn’t it appealing? This could work if you don’t have too much equipment, so that it can blend with your living room furniture. Whether you like it or not, you need a stability ball. Even if you’re all about bulking up, you need to know that a stability ball will help with flexibility and balance. Actually, it is the best and cheapest way to improve balance, so it has to be a part of your home gym. You can do a lot of exercises on it, such as crunches, squats, curls, and so on and so forth, and increase your core strength. Even though they’re quite cheap, try not to get the cheapest, because they’ll end up popping under you and you could seriously injure yourself if they do. Spend a few extra bucks on a good quality one and you’ll reap the benefits. Good ventilation is a must in a home gym and to be honest, the cheapest and best option is a window. However, a fan or a natural ventilation system could also work. Air conditioning is alright, but expensive. If you have AC throughout your house, then your home gym needs to take advantage of that, too. You simply cannot have a home gym without dumbbells, and if you’re willing to invest a little time into choosing them, you can actually make them look quite nice in your home gym. Who said that dumbbells cannot be fashionable? They are some of the best house gym equipment ideas. We suggest you get a set of good quality adjustable dumbbells, from 40 to 200 pounds. They’re quite compact and you can do a large collection of exercises with them. 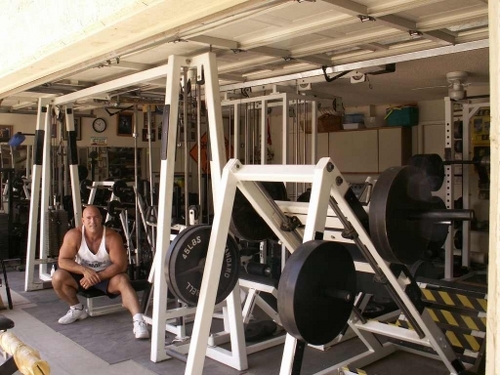 If you don’t have enough space in your house to set up your home gym, then we recommend the garage. 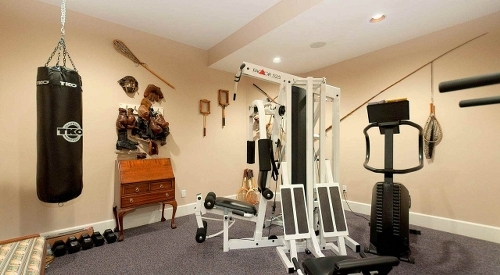 There is a plethora of home gym ideas for the garage online – all you need to do is start your search. All we need to tell you before you start is that you should talk to people online or in real life who already have a home gym in the garage, because they can tell you everything you need to know about how to transform your garage in a home gym. Man or woman, you need to have a heavy punching bag in your home gym. Just look at how great it looks, and it does so much more than look great. Try different styles and techniques to improve your speed, endurance, and strength. Move side to side, improve your right crosses or your short range uppercuts. If you don’t know what we’re talking about, then do a little research online and know that a heavy bag is perfect for relieving stress after a hard day’s work. A quality heavy bag is made from tough leather and comes in various sizes. Choose a heavy bag that has chains and not straps that you use to hang it off your ceiling. When building a home gym, the equipment is not the only thing you should think about. The flooring is just as important, since unfit flooring can cause you injuries. 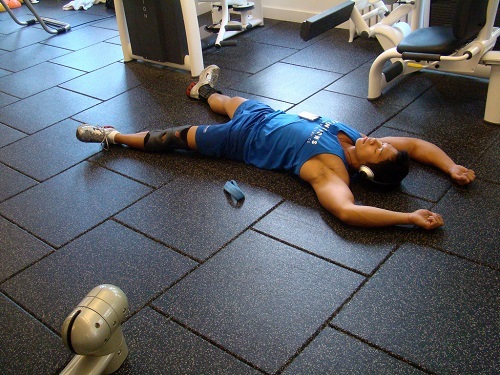 The best type of flooring for a home gym is rubber, since it is non-slip. At the same time, keep in mind that the flooring should also be firm enough to sustain the weight of the equipment you want to use. If the flooring is too cushioning, it may be good for your body, but it won’t be good for your wallet in the long run, since it may get damaged quickly. Can You Build a Home Gym on a Budget? Gym equipment isn’t cheap, but it doesn’t have to cost you a fortune either. Our tip for you is to avoid buying new equipment. You don’t need it to be brand new, do you? Then you should check out websites and forums that sell second-hand exercise equipment. The best place to start your hunt for machines is around March. Want to know why? Because many people buy workout equipment and machines as a New Year’s resolution, but when they see that they can’t keep their promise, they choose to sell them, as to avoid the constant reminder of their workout failure. Also, gyms are always going out of business, so you can ask around and see if there are any around your area from which you can buy some equipment. Putting together a home gym on a budget is possible, but there should be one thing, one piece of equipment on which you’ll need to splurge. You simply need to have in your home gym something that you know will work well and that will stand the test of time, no matter what. Our tip for this is to invest in your passion. If you’re an avid runner, then you should get a really good treadmill for your home gym, because if you don’t, you can risk damaging your knees and joints, because some treadmills give your body the impression it’s running on concrete. Prepare to spend a few thousands on a good treadmill. 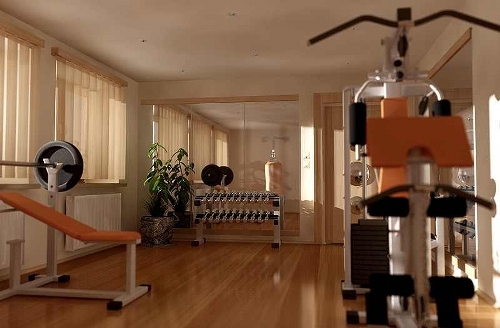 We hope we’ve provided you with a clear image of what you need for creating a home gym. 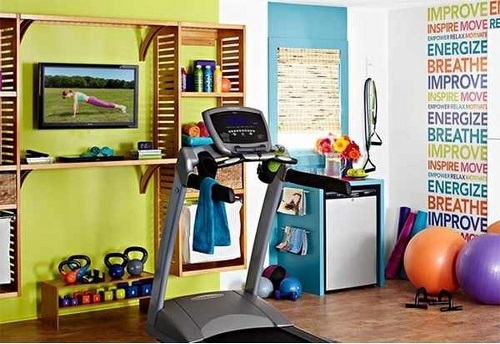 Our home gym ideas are here for you to serve as inspiration and motivation. We also hope that you use your gym as often as possible and make the best of it. 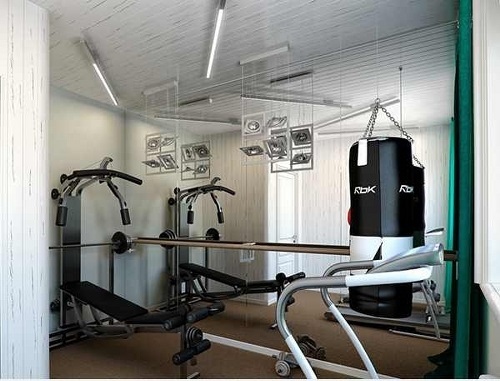 If you would like to share some of your home gym ideas, then we invite you to do so in the comment section below. We love hearing from our readers!